What’s a green smoothie? Water, greens and fruit… why drink your greens? We know we don’t eat enough fruit and vegetables and raw fresh food-especially leafy greens. Sitting down and chewing through 2-3 cups of raw dry green salad everyday without oily salty dressings isn’t really very appetising. So how do you get more raw leafy greens into your day without all the extras and without losing nutrients by cooking? EASY- blend your greens with fruit. Green smoothies are easily digested because blending breaks down the fibrous greens. 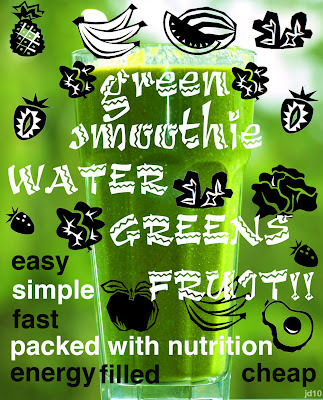 When you blend greens with fruit you don’t taste any overpowering “greenness”! Which means if it tastes good-you’ll want more…! WHY BLEND? After years of eating mainly soft food our teeth really aren’t powerful enough to break down fibrous greens into an easily digestible form. When we blend our greens with fruit and water they are broken down so we get the maximum nutrition from them. Nutrients are absorbed quickly and easily. The fruit turns the greens into a delicious, easy to make nutritious/cheap and portable food. 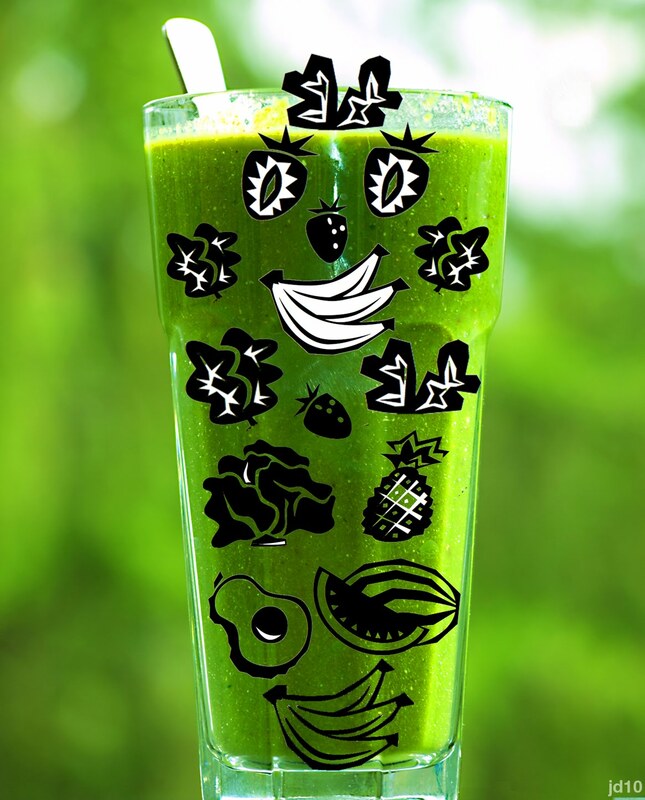 Drinking green smoothies everyday will give you much MORE than the recommended daily servings of fruit and vegetables. Packed with fibre the fruit sugars are absorbed more slowly. Green smoothies are a complete food. discover the world of greens- start with (preferably organic/locally grown) baby spinach, silverbeet, spinach, continental parsley,cos and dark green lettuce, celery and cucumber- then get adventurous- kale, carrot tops. beetroot greens, watercress, chicory, dandelion, mitsuna, tatsoi, bokchoy, choysum, sweet potato leaves, sorrel. What fruit can I use? You can use any fruit-fresh in season or frozen. Bananas and mangos make the smoothie really thick and creamy- especially frozen bananas. You can also use frozen and fresh berries, kiwi, apple, oranges, pears, peach, nectarine, plums, grapes, medjool dates, pineapple, watermelon, pawpaw, melon, goji berries and lemon/lime juice and zest. 1. blend 1 cup of cold water or juice/coconut water (or an orange-without skin) and 8 ice cubes and juice of a lime and lemon to make liquid base. 3. add your fruit -frozen banana will make it really creamy.You can use any type of fruit like mango/ kiwi/ pineapple/ berries/ passionfruit/ peaches/ pawpaw/ watermelon/ nectarine. 4. my (optional!) essential extras are a piece of ginger, the skin of half a lemon, handful of goji berries, 2 medjool dates, 2 tbs of ground chia and a tbs of coconut oil. Blend till smooth and you cannot see any visible bits-add more lemon or lime juice if it needs it. Enjoy! Find the right balance of greens and fruit that works for you then gradually increase your greens and reduce the fruit…aim for more greens than fruit. I slowly worked my way up from 2 cups of greens to 6 cups over a year-spoon standupable! You may find as you decrease your cravings for sugar you’ll want to decrease the fruit in your GS. Try for some different greens everyday…adding ginger and lemon/lime juice can make a bland smoothie brighter. Set yourself a challenge-drink a green smoothie everyday for breakfast (and more if you want) for a fortnight or longer to gain maximum benefits. Buy dark green leafy greens-avoid wilted greens. When you get home wash your greens,store in airtight bags and they’ll stay fresher longer. Go online- there are nearly a million hits on Google for green smoothies. You’ll find websites, people blogging, countless recipes and different combos to try plus tips and advice on green smoothie making and greens. Check out my book here- dailygreenbar guide to green smoothies packed with info and great artwork to win over the most reluctant green eater you may know! Hi Dan I may have replied before but the new website conversion deleted some of my replies. Thankyou for your great feedback and hope you like the new look! Thanks Jane! I am keen to give it a go!